High Crown. Style: 20554776. Raised Embroidery Letter on Front Middle. Structured Fit. Raised Embroidery on Back Center. Details As seen, bought new, never worn. Size: Touch Fastener Adjustable Strap. Condition: This Cap is in New Condition! Color: Black. CHARLOTTE BOBCATS NBA FLEX-FIT STRETCH FIT SIZE ADULT LARGE REEBOK CAP HAT NEW! COLOR: ORANGE W/TRIM. TEAM LETTERING EMBROIDERED ON THE FRONT,NBA LOGOON THE BACK. Size: ADULT FLEX FIT. COLOR: WHITE W/TRIM. TEAM LETTERING EMBROIDERED ON THE FRONT,NBA LOGOON THE BACK. Size: ADULT FLEX FIT. Have your little one show your team pride in this lifestyle snap back hat by Adidas. Youth one size fits most (8-20). Youth & Toddlers. Your cooperation is appreciated. CLEARANCE . NBA Charlotte Bobcats Fitted Hat. Bobcats logo embroidered on front. Adidas logo embroidered on right side. Stretch fitted, one size fits all. NBA logo embroidered on back. Gray, white and orange. Gray under visor. Charlotte Bobcats NBA Youth Flex Hat. Stretch Fitted. Size: 4-7 Years. Charlotte Bobcats NBA Structured Hat. Curve Bill. Adjustable Velcro Strap. The Charlotte Bobcats joined the NBA as an expansion team in 2004. Charlotte Bobcats Adidas Official Team Headwear NBA cap. Gray, red, silver, white. Embroidered with a fierce Bobcat emblem on front and "Adidas" legend on side. Charlotte Bobcats NBA Hat. Curve Bill. Color: Orange with Gray Trim. Adjustable Strap. 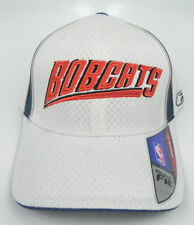 Charlotte Bobcats NBA Structured Hat. Curve Bill. Adjustable Strap. Charlotte Bobcats NBA Hat. Stretch Fitted / Flex. Curve Bill. Color: Black. Charlotte Bobcats NBA Flex Hat. Curve Bill. Stretch Fitted. Stretch Fitted, Structured, Mid Crown. Flip Color Normal Bill (Orange Underside). Back Design - Flat Embroidery NBA Logo Man Center Rear. Size: L/XL - Fits hat sizes 7 1/8 - 7 1/2. HAT TRICK FAN GEAR. CHARLOTTE BOBCATS ALL RED NBA ADJUSTABLE STRAP-BACK ELEVATION CAP HAT NEW! COLOR: RED. NBA ADJUSTABLE STRAP-BACK CAP HAT NEW! Never worn ! 20 plus years old ! Collect or wear. Pre-owned, no stains or fading, embroidery looks good. NBA Charlotte Bobcats Hat Cap NWOT Free Ship! Charlotte Bobcats adidas Reversible NBA Basketball Knit Winter Hat/Toque/Beanie hat. Screened and Raised Embroidery Logos. Material: 100% Acrylic. HAT TRICK FAN GEAR. We appreciate your cooperation. THIS IS A NEW NBA CHARLOTTE BOBCATS ADIDAS SNAPBACK HAT. TEAM:CHARLOTTE BOBCATS. STYLE: FLAT BRIM SNAPBACK. AUTHENTIC ADIDAS HAT. COLOR: GRAY AND BLACK. 65% ACRYLIC, 35% WOOL. Style: NBA Courtside 2013-2014. Team: Charlotte Bobcats. Stretch Fitted. Structured Fit. Raised Embroidery - logo (front). Hat is used but not abused. Has velcro strap back to adjust. Charlotte Bobcats adidas TY13Z Pro Shape NBA Flex Fit Cap/Hat. Embroidered Adidas logo left wear side. Embroidered Phantom NBA Logo Man on Back. Stretch Fit - Large/XL - Fits hat sizes 7 3/8 - 7 5/8. THIS IS A NEW NBA CHARLOTTE BOBCATS ADIDAS DRAFT CAP SNAPBACK HAT. TEAM:CHARLOTTE BOBCATS. STYLE: DRAFT CAP SNAPBACK. AUTHENTIC ADIDAS HAT. 65% ACRYLIC, 35% WOOL. 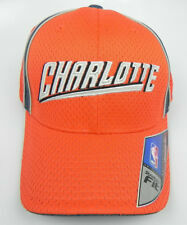 Nba Official Charlotte Bobcats Hat Adidas Orange Blue New Without Tags. Condition is New. Shipped with USPS First Class Package. Team: Charlotte Bobcats. Style: Winter Cuffed Knit Beanie Hat. Sport: NBA.